Great for picnics and lawn seating. The size is 60 x 50 which means there is enough room for a friend. 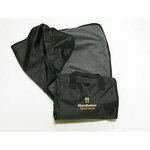 The packable blanket is water repellent on one side and fleece opposite side. It has a velcro closure, web straps and outer double pocket. On the water repellent side there is our Spartan head, Manchester and Spartans embroidered on it.